I am so excited to be participating in this year’s Freaky Friday Blog Hop: Spring Edition! This group is the brainchild of my friend, Michaela’s and it is SO MUCH FUN! For those of you that aren’t familiar with Freaky Friday, it is a group of food bloggers that get assigned a secret blog and we get to choose any recipe we want to make from it for our own blogs. Then all of the recipes are revealed at the exact same time and we get to see who had our page and which recipe they selected! It has been a great way for me and my readers to find new blogs to follow, and I feel honored to be a part of it! The blog I was assigned this go ’round was The Flavor Bender. Dini prides herself in combining flavors in new and wildly creative ways that will make you fall in love with cooking and baking (if you haven’t already!) On her gorgeous blog you can find everything from appetizers to main meals and desserts to cocktails. I love that she uses easy to find, everyday ingredients in her recipes. The very first recipe that caught my eye were her Easy Oven Baked Chicken Fajitas. Lord have mercy does that delicious! Her Apple & Bacon Grilled Cheese Sandwich is going to be lunch for us this weekend. 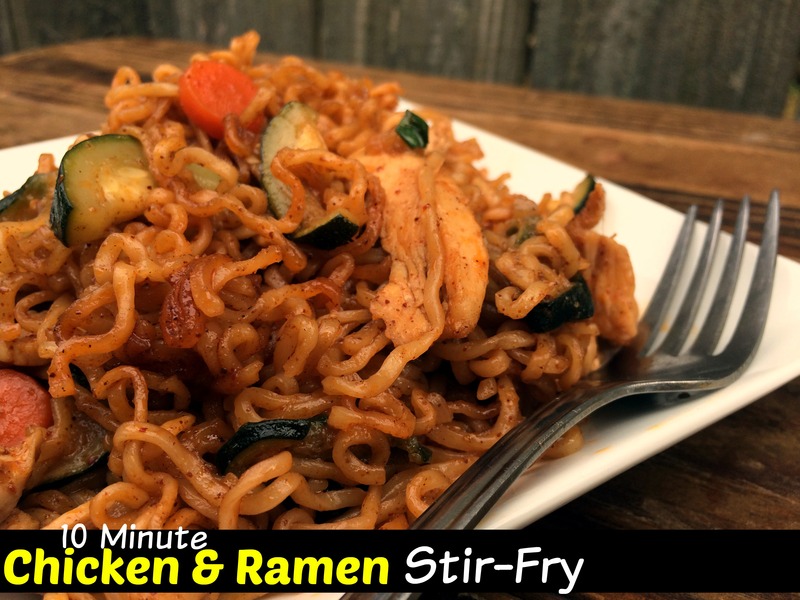 The recipe I decided to make first was her 10 Minute Chicken Ramen Stir-Fry. I am obsessed with 1 skillet meals and Chinese food at home is one of my favorite take out fake outs! You guys, O.M.G. you guys, this may be my very favorite skillet meal yet. I doubled her recipe since hers was for 2 and I cook for 4 and it turned out PERFECTLY. I am seriously upset that there wasn’t any leftovers for my lunch the next day LOL! I pre-chopped my veggies and chicken while I was prepping lunch and had my cutting board out anyway, then dinner took less than 10 minutes! To be honest, when I saw she didn’t use the flavor packets that came with the ramen, I was a little weary because, as bad as those little packets are for us, they do make delicious flavor. Well I shouldn’t have doubted for a second, because her recipe made the most delicious ramen I have ever tasted! Heat oil in a large skillet over high heat. Add chicken and veggies to pan and cook for 2 minutes. Break each package of noodles into (at least) 4 pieces and add them to the skillet, along with brown sugar, chili powder and garlic salt. Saute for 2 minute longer, stirring constantly. Turn heat down to medium and add soy sauce and water. Cover with lid and let steam for 4 minutes or until noodles soften. Break the noodles apart and mix everything well so that they are coated with the liquid. Keep cooking & stirring for another minute or 2, or until the noodles are done to your liking. Stir in sesame oil and eat hot! Enjoy! What?!?!? Dinner done in 10 minutes?! I am in!! I am loving the sound of this sauce too… way better then the dry packet!!! Cant wait to try this Brandi! You know I am trying this!! Ramen is a staple at my house with my kids, and to make it with all fresh ingredients is all the better! 😉 Thank you for being in our group — you know I love having you here! I love quick dinners like this. Can’t wait to give it a try! I am sold on this dish! My oldest son will be home from college in a couple weeks and the kid LOVES ramen! I am making this as a surprise for him! Honestly, you can’t go wrong with a 10 minute recipe. Especially one that looks as amazing as this one. This has to the best ramen noodle recipe I have seen! Love it! I love how quick this is, while also being totally drool-worthy! I can’t wait to try this recipe! Just what my family will love, and I love that it comes together so quickly! YAAY! I am so glad you loved this recipe!! 😀 It’s one of my oldest and one that I do most often too I definitely need to revamp the photos again! So so honoured you got my blog! Oh my stars does this sound delicious! I’m seriously making this for dinner this week. I know my family is going to love it!!! This is the most perfect recipe for a noodle-loving household like ours! These noodles sound amazingly delicious and the 10 minute thing is just the deal sealer! Isn’t it amazing that delicious dishes don’t have to be complicated or time consuming! Great job! Well I actually made this tonight, and it is a very good recipe. Perhaps 10 min. to cook, but there is some prep involved in collecting the ingredients and measures, and cutting, etc. All that said, I would make sure you have a BIG frying pan for this.